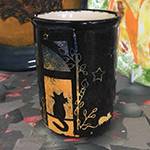 We have some fantastic new adult art workshops planned for 2019, and this year we are running these alongside our usual Pots and Pinot evenings AND on weekday sessions so you can pick and choose the most convenient session for you! 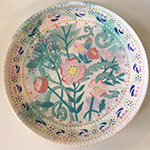 Our staff will lead these workshops, teaching you fabulous painting techniques, using specialist tools and equipment and helping you create the most beautiful, creative and unique finished pieces of pottery. See the session timetable and more info here. 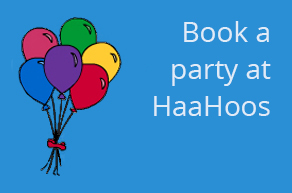 HaaHoos is celebrating our 8th Birthday! We can’t believe it but we’re going to be 8 years old this year, and to celebrate we’re having a fabulous birthday party and you’re invited! We’re running a FANTASTIC OFFER for just that one day as well! 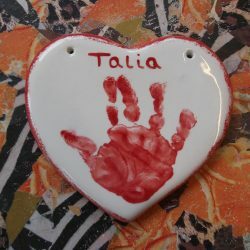 All pottery pieces will be priced at just £8. Yes only £8, for one day only! And the studio fee of £2.50 will also include a Christmas angel for every painter to paint which we will then use to decorate our tree, at the Twyford Tree Festival. And of course, as it’s our birthday party, there will be cake and bubbles for our customers! Monsters, Magic & Mythical Beasts after school art club, new for Sept 2018! This Autumn we’re running our fantastic new after school art club every Thursday from the 20th September – 11th October, 4pm – 5pm. Every week will have a different activity with an exciting craft for the kids to get stuck into and will be focused around the exciting theme, ‘Monsters, Magic and Mythical Beasts’. 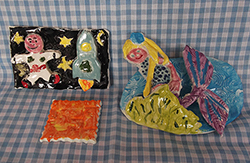 There will be lots of painting, making, glittering, gluing and magic to go along with each creative craft project! Drop the kids off for the sessions which will be supervised and run by our helpful and friendly staff members. £40 per child for the 4 week course. Some projects will overlap different weeks so attendance at all 4 weeks is necessary. For children ages 6 – 12 years old. Drinks will be provided. Book your child’s place now by calling or emailing us! Full payment must be made with booking and completion of our parental consent form is needed before the Art Club starts. 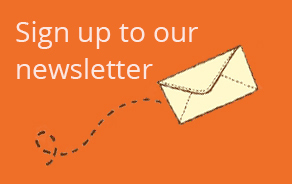 We will email the consent form to you or just pop into the shop to pick one up. 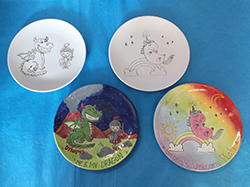 Clay Make and Paint – Scary Spoon Rests: Create a fun and scary monster, or a cute unicorn spoon rest out of clay and get creative with all our stamps, cutters and tools to create some amazing textures and patterns. This is a project that runs over two sessions. Collection of the finished piece will be on week 4 of the art club. 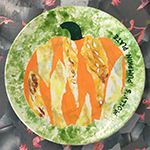 Fantasy Silhouette Pottery Painting Door Plaques: Let your kid get messy with this fun fantasy session. Using our huge variety of silhouettes we create a splattered starry bedroom door plaque using a special technique with a paint brush and pottery paints! The kids can also use our special Fairy Dust glaze which sparkles once fired. Ready to collect on week 3 of the art club. 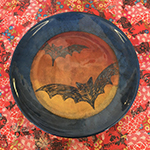 Clay Make and Paint – Scary Spoon Rests: The second session of two where the kids will paint the scary spoon rests they made in week 1, with loads of bright colours to make them look even more magical and scary! 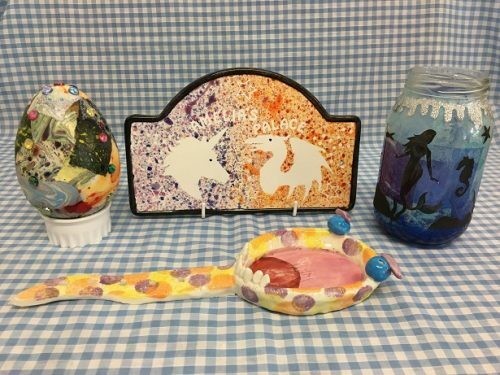 Marvellous Marbled Dragon Eggs: The kids will create marbled dragons eggs and decorate them with gems and jewels. Ready to collect on week 4 of the art club. Mystical Dreamy Nightlights: Create a beautiful or scary nightlight and decorate it with glitter and loads of silhouettes of mermaids, fairies, unicorns, dragons or monsters and more. Ready to take home on the day.